Working with glass is a specialty of Jeff Grainger Studio. The colors and textures of iridescent or art glass create a distinctive look for your lighting fixtures. Stained- and leaded-glass shades and panels illuminate the Arts and Crafts designs often built of mahogany or oak. Glass panels, windows, and shades bring a bright touch to your home with an array of greens, blues, and reds. The clean lines of your Frank Lloyd Wright-inspired design and organic forms of a Greene and Greene-inspired piece pop with color against wood or metal fixtures. These ornamental and functional pieces are instant indications of the Arts and Crafts home. Jeff creates decorative and functional glass pieces for indoor and outdoor use that warm each space. See his work and be inspired by how a custom glasswork project will look in your home. 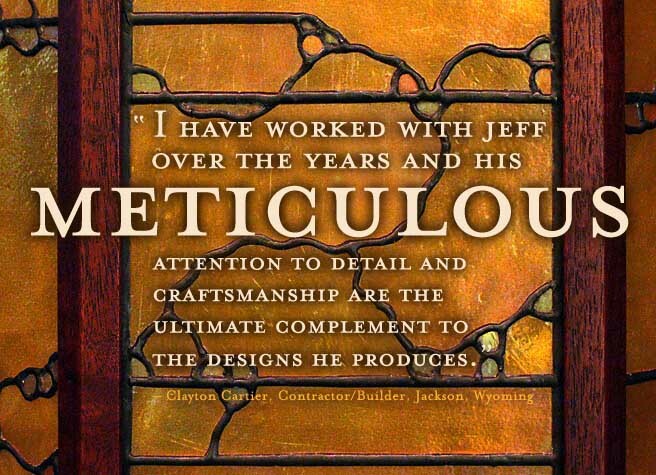 He’ll design beautiful custom stained-glass lighting, windows or panels for your home.